Golf is a game of balance. Grip the club too tightly, and you’ll tense up your body. Hold it too lightly, and you’ll end up with a limp handshake and so-so results. Plus, a body too tense or lax creates mental stress, and that’s the last thing you need to make the ball go where you want it to be. We engineered a tool that helps you achieve this balance – without any extra effort. Our new RelaxGrip® 2.0 glove helps you to effortlessly increase your performance and have more fun playing your favorite game. “It’s like an automatic pre-shot routine! I’m an amateur golfer, and my mind still wanders a lot when I’m at the tee. With this glove, I don’t need to think so much about the right amount of pressure on the club. It just, like, the club just snaps into place! Getting the grip right is among the most challenging aspects of golfing that can create a fair amount of mental stress. Like a winter glove automatically warms your hands, the RelaxGrip 2.0 adds an extra relaxation layer to your hand, providing instant relief and balance. Get a Confident Grip. Stay in Control. Twisting your hand even a tiny bit during downswing will make the ball diverge from its path by a dozen yards. You’re in full control of your swing only when you grip the club with the exact right amount of pressure. The RelaxGrip 2.0 with its patented pad system keeps each part of your hand right where you need it to be – down to the fraction of an inch. Get in the Zone. A/C included. Your hands are delicate machines that work best in conditions just warm and dry enough. The breathable elastic honeycomb design and Terrycloth lining of the new RelaxGrip 2.0 create an ideal hand climate, and getting into the Zone comes more naturally – as does your performance. “I forget the glove is even on my hand. Did we mention that this glove looks great on you? Many golfers want to look great without making too much of a fuss. After all, understatement is part of the delicate balance of the game. The RelaxGrip 2.0 reveals its special features only at second glance. Once your friends find out why you’re so relaxed and good-looking, you’ll be glad about the tight-fit Velcro strap that secures the glove to your hand only. Many golfers remove their glove when retrieving the putter from the bag. This is a hassle, and it quickly wears down their gloves. 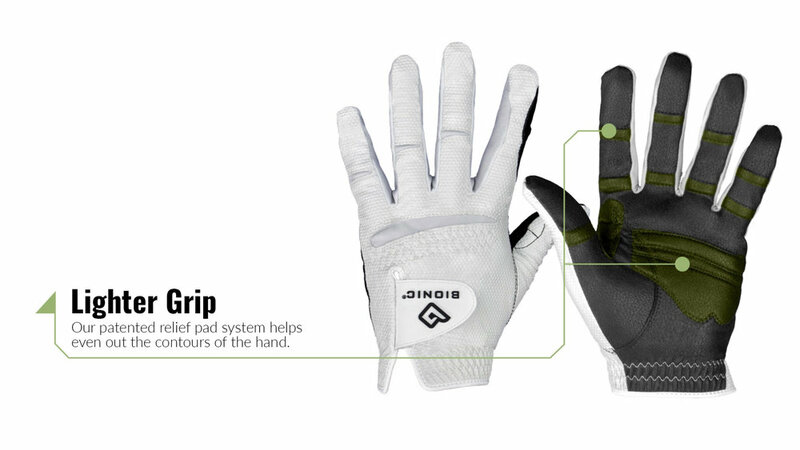 With its patented relief pad system, web and motion zones, and improved moisture management, keep the RelaxGrip 2.0 on your hand during the entire game. Our company, Bionic Glove Technology, is a division of Hillerich & Bradsby Co., makers of the world-famous Louisville Slugger baseball bats. We’ve been in the business of delivering performance for more than 130 years, and we’re proud to offer you an opportunity to easily improve your game of golf – and have more fun on the course.